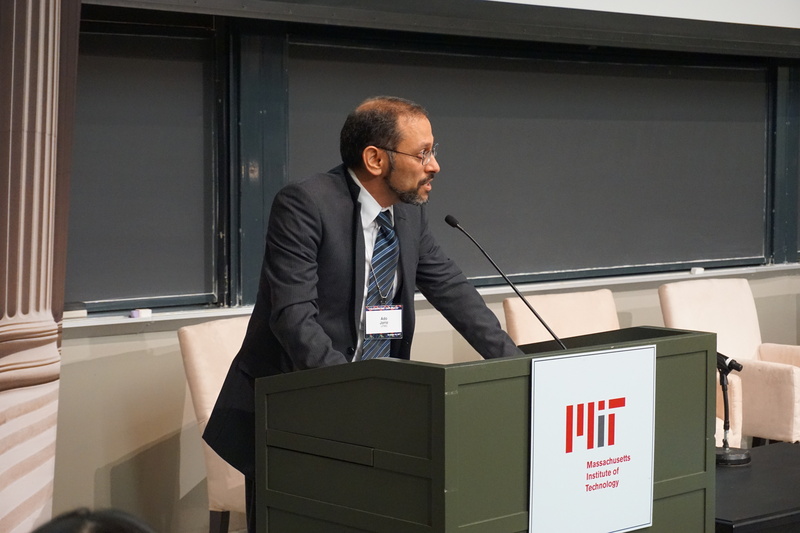 Ado Jorio summarizes Millie's adventures in carbon from the 1960's through 2017. Good afternoon, everybody. First, I would like to compliment Gene — and, in his name, I would like to compliment the rest of the family. I also would like to compliment Marianne — and, in her name, to compliment all of the women in this auditorium. When we look back at all the papers published on carbon, across the years of Millie’s life, we see a revolution in a carbon research. And that reminded me of that first question we’d asked — where do we come from? The answer: we all come from carbon. And Millie was the Queen of Carbon. When we look at all that has happened in this field, we can see that Millie was at the beginning of everything. The graph above shows the number of papers Millie has published that contain the word ‘Raman’ in the title. Keep in mind that we know Millie has over 1,000 papers published. When I first committed myself to giving this talk, I said, “There’ll be no way I could find out precisely how many papers Millie has written on Raman spectroscopy in carbon — to do that, I’d have to read and sort through over 1,000 papers!” But, then, I realized that searching for the word ‘Raman’ in the title might give a small representation of this proportion. 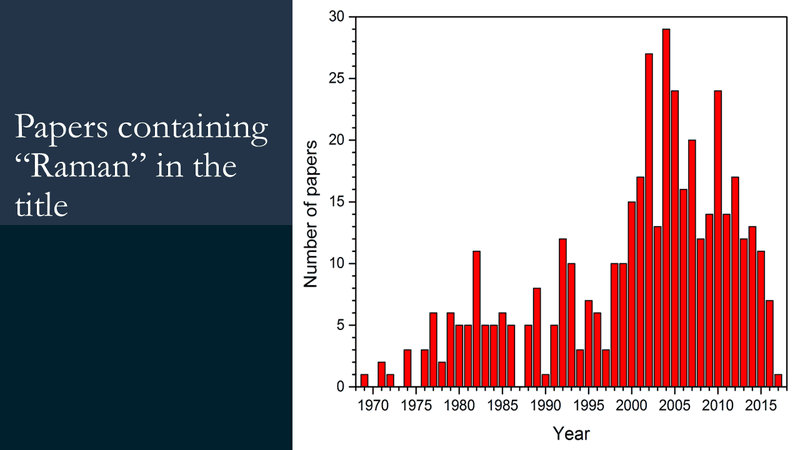 You can see, on the graph, that the word ‘Raman’ appears in the title of more than 350 of Millie’s papers. So, let’s look into the history of these papers. We’ll start in the 1960’s, when not much was known about carbon or graphite. 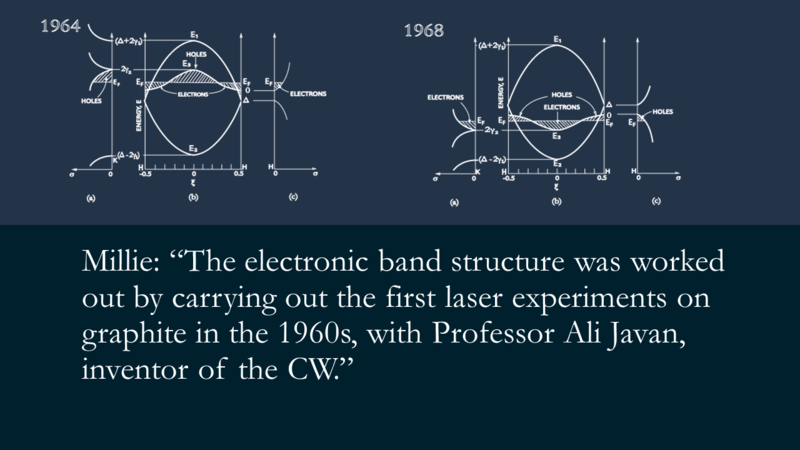 Millie worked with Professor Ali Javan to do some solid state spectroscopy using some of the lasers that Javan was developing. What was intended to be, in Millie’s words, “an innocent experiment” wound up turning graphite on its head — literally. They discovered that what everyone had assumed were holes were actually electrons and vice versa. Now, let’s look at the 1970’s. Here, we see Millie’s collaboration with Jean-Paul Issi — and Jean-Christophe Charlier will speak more about that, in a moment. The 70’s marks the beginning of Millie’s research into graphite intercalation compounds — and these types of compounds, nowadays, are everywhere, even in our technology. But in the 70’s, this was new research. Millie showed that in the intercalation of irons in the layers of graphite, they can intercalate in every layer, every second layer, every third layer — and this is the beginning of controlling these materials. Also, in the late 70’s, there was an energy crisis. Millie, eager to help, believed research into carbon fibers could be the answer. She began looking into carbon fibers with a student, and together, they made (in Millie’s words) “a small amount of progress”. In 1980, they presented their findings at a carbon conference, and that was where Millie first met Endo-sensei. Let’s look at the 1980’s, now, as a whole. In this decade, Millie researched graphite, ion implantation, and carbon fibers. Endo, as mentioned before, was a big part of that. Now, carbon, in general, is all about the structure of the hexagonal bondings between atoms — and that remains true for the whole spectrum of carbon, from the perfect crystalline graphene all the way to dirty charcoal. Millie’s papers, at this time, were the first to show how you can visualize and control the defects and the amorphisation structure of carbon. Let’s move a little later. In the 1980’s, Millie and Gene started looking into carbon clusters. Millie, noticing that her laundry was surprisingly dirty after working in the lab, talked to Richard Smalley about clusters and encouraged him to look into it. In 1985, Smalley was one of the researchers who discovered fullerenes. This is part of the “magic touch of Millie”. When Millie reaches out her hand of inspiration and places it on your shoulder, that is a sure sign that you will go far. So, in the late 80’s and early 90’s, Millie did a lot of research into “that beautiful molecule” (her words). This was the time of Millie’s collaborations with Peter Eklund — a very good friend who, sadly, isn’t with us anymore. 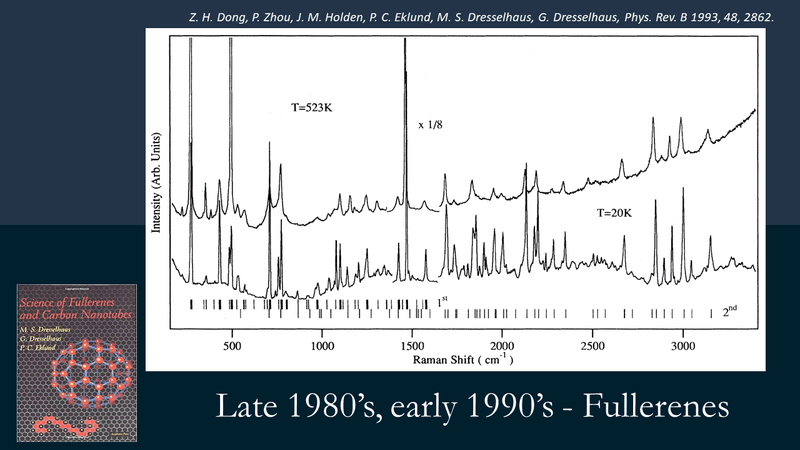 It was also an important time for the field of carbon science, as fullerenes were one of the first big bolts of energy that helped popularize the field. But it’s still important to remember that the fullerene discovery could never have been possible, if Millie had not done all the research before it. Millie both launched the field, and she launched the people that would become leaders in the field. Moving onwards, in 1990, Millie attended a DOD workshop with Smalley, to discuss carbon fibers and fullerenes. While answering a question, Millie hypothesized the possibility of a new structure called a “carbon nanotube”. This structure was observed by Iijima-sensei in 1991. 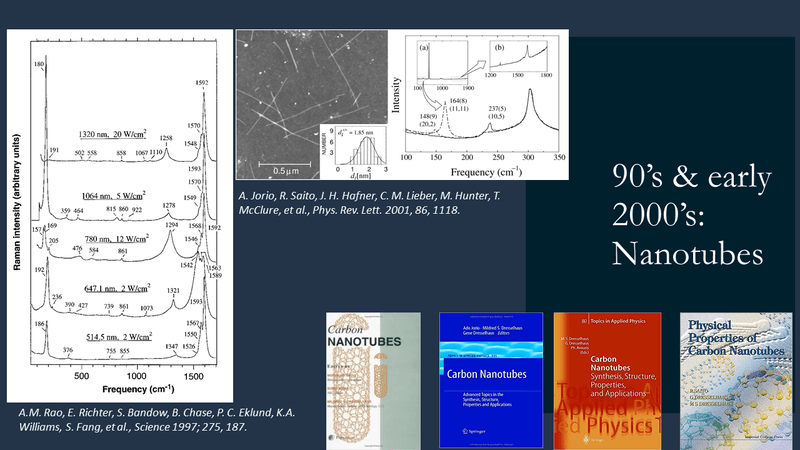 Thus, the 1990’s and early 2000’s marked the revolution of carbon nanotubes. This is also the point at which a lot of people entered the field. This is where Saito comes in, Antonio, myself, Marcos… Actually, I’d like to give special thanks to Marcos Pimenta, because he was the one who first introduced me to Millie. And, as it happens — you remember the “magic touch of Millie”? Well, today, Marcos is the president of the Brazilian Physical Society. So, you can see, the magic touch works! So that’s Millie’s history in carbon. Notice that, on this slide, I show all these graphs that are related to the inelastic scattering of light. 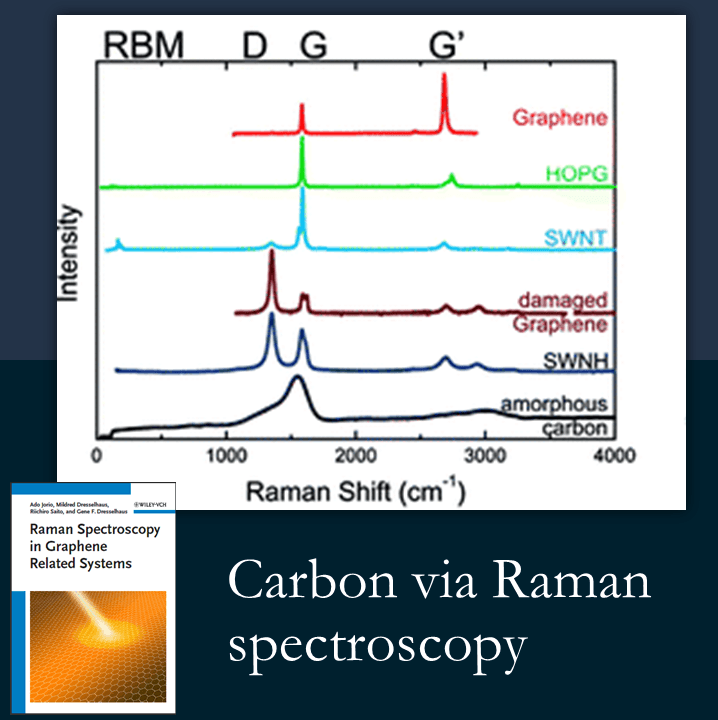 Why did I choose Raman spectroscopy? We’re all sharing, with each other, the many things we learned with Millie. And Millie is an expert on Raman spectroscopy — one of the most important experts in the world. Of course, there are others, and Millie would always point that out when she was asked. That was characteristic of the way Millie would look at and discuss things with others. She always pointed to the good things and the interesting things that people didn’t necessarily know about. I will stop, now, with this first question, “Where do we come from?” Because we know the answer — we come all from carbon! We’ll move on to the next question, “What are we?” The answer to that one is more in depth. I will now pass the microphone to my colleagues, starting with Jean-Christophe Charlier.